The striker scored two goals in quick succession just before the half hour mark. Minerva Punjab FC handed a 2-1 defeat to Mohun Bagan at the Vivekananda Yuva Bharati Stadium on Wednesday (January 10, 2018) to leapfrog another Kolkata giant Kingfisher East Bengal to the pole position with 19 points, one point more than the Red & Gold’s tally having played one match less. A brace from Chencho (23′, 30′) was enough for the Ludhiana based side to get the better off Mohun Bagan as the Mariners had to settle with a consolation goal from Kingsley Eze. Mohun Bagan coach handed Beingaichho Beikhokhei his first start in Hero I-League 2017-18 while goalkeeper Shilton Paul had to sit out this match with an injury, who was replaced by Shibinraj Kunniyil. Minerva Punjab, on the other hand, went for an extra man in defence as Deepak Devrani made his place in the starting XI replacing goal-scorer of the previous match Bali Gagandeep. It was a fluent start from Mohun Bagan as they made their intentions clear from the very start pushing Minerva Punjab on their back foot. The Mariners had three flag-kicks in the first ten minutes but failed to make them count. Minerva Punjab got the first sniff of goal when skipper Kasim Aidara laid it off for an over-lapping Kamalpreet Singh whose blasted effort at goal lacked direction to test Shibinraj. It was the Bhutanese international Chencho who drew the first blood as he first dodged past the defender and fired a bullet-shot towards Shibinraj, who was completely taken by surprise. Within minutes Minerva Punjab could have doubled their lead, but this time the goalie came out on top in a one-on-one situation with Chencho. 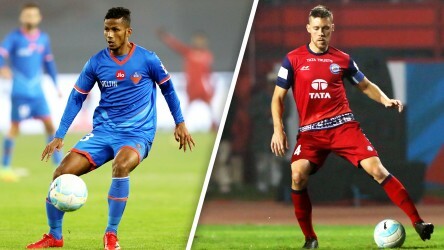 But the Punjab side did not have to wait long for their second goal as the Minerva number 7, produced a world-class finish at the far post after an inch-perfect through was threaded to him by William Asideu. Mohun Bagan got the opportunity to peg one back on the 36th minute, but Ansumana Kromah failed to convert from the spot with a feeble attempt which was saved comfortably by Rakshit Dagar diving low to his left. Mohun Bagan started the second half with the same tempo, but their repeated efforts to breach Minerva’s defence were turning futile. Just after the hour mark, Aser Dipanda pulled the trigger from point-blank range after Kromah played it to him, but his effort was directed straight towards Dagar who fisted away to safety. Minerva continued to maintain shape and their defensive organisation remained a hard nut to crack. Dipanda got another shot at the target during the injury time, but his effort went across the face of the goal without testing Dagar. Kingsley Eze scored a screamer at the dying embers of the game, but it was too little too late for the Mariners to get one point as Cameron Watson blew off a chance to draw level minutes later. Mohun Bagan will go into the famous Kolkata derby on January 21 at the back of this defeat whereas Minerva Punjab will next face Shillong Lajong on January 14. Minerva Punjab FC regain the coveted pole position with 19 points from 8 matches whereas the Mariners, six points adrift, are stranded in the fifth spot.